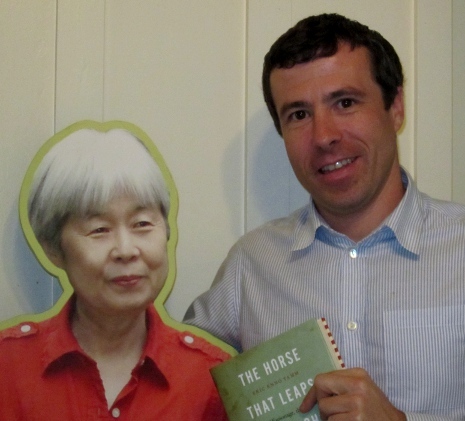 Eric Enno Tamm was the second writer to visit Kogawa House. A journalist with two books to his credit, both involving historical figures, vast amounts of research and arduous travel, he arrived at the house with a slideshow in his flash drive. The living room wall became a screen, and off we went on a time-travelling tour of Central Asia. One hundred years later, Eric finds history repeating itself. He draws parallels between that time and this: China opening itself to the West in the wake of the collapse of the Qing Dynasty and China’s contemporary embrace of Western capitalism; the battle between old authority and the forces for change, then and now, the clandestine presence of missionaries in the hinterlands, the efforts of the State to deal with the ethnic minorities by encouraging the emigration of Han Chinese to the region. The little living room was packed — it only takes about twenty-five people! But it worked. The photos were vivid, the maps understandable sideways, and Eric is a spirited raconteur. Even the appearance of late-comers couldn’t throw him off the narrative. The conversation afterwards ranged from the dangers of travelling as he does, of being a foreigner and a Caucasian, and to the challenge of finding guides and interpreters locally. But he also spoke of his research, which included putting in some time riding before leaving Canada as he’d actually never ridden a horse. The photo here of Eric and Joy Kogawa — like the one above of Evelyn Lau with Joy, Todd Wong, and me — is a Kogawa House tradition. No, Joy doesn’t wear the same red dress all the time. It is, in fact, a life size cut-out of Joy at the time of British Columbia’s 125th Anniversary when 125 significant British Columbians were immortaliozed in a special exhibit at the Royal Victoria Museum. All visiting writers are photographed with Joy. By the way – don’t make the mistake of taking The Horse with you to read at the cabin in the woods. This is one book you need to read with your mouse. All the pictures and maps you need are on the book`s website, and it’s a fabulous added dimension. Postscript: The Horse that Leapes Through Clouds has won the City of Ottawa book award for non-fiction.